ATTLEBORO, Mass. 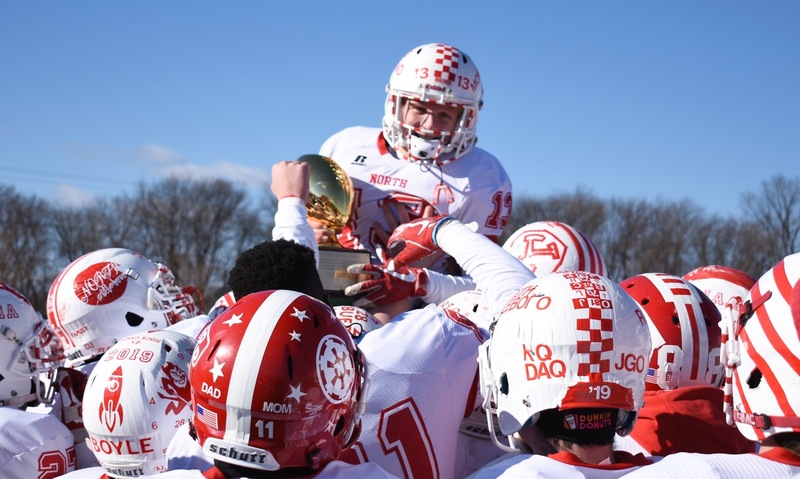 – The North Attleboro players looked around for Hilda, the trophy awarded to the winner of this Thanksgiving rivalry, but the trophy was nowhere to be found. So, instead, the Rocketeers lifted freshman kicker and quarterback Tyler DeMattio to celebrate another win in the long-running series with Attleboro. It was fitting that DeMattio’s teammates would lift him up after the game, since he stepped up in the second half and propelled North to the victory. In his first snaps as varsity quarterback, DeMattio scored three touchdowns and accounted for all of North’s points on Thursday morning at a bitterly cold Tozier-Cassidy Field, sparking North to a come from behind 20-7 win over the Bombardiers. “Tyler is a talented player, who has had a great year as a freshman and we’ve been watching him all along and felt like he was the next best available quarterback, so got him ready,” said North coach Don Johnson about DeMattio stepping in for the second half. He joked that DeMattio was North’s “secret weapon” and agreed that he was the “spark” that the Rocketeers needed. Attleboro came close to adding to its 7-0 halftime lead on its first possession of the second half. Justin Cote (24 carries, 114 yards) and Jason Weir (14 carries, 95 yards) continued to find seams in the North defense and moved the ball down to the Rocketeers eight, using up almost the entire third quarter in the process. Ethan Friberg stuffed Alex Rodrigues for a four-yard loss, Tom O’Neil stopped Weir for no gain and on fourth and nine John Kummer caught Cote after just a yard to get the ball back. DeMattio took over from sophomore quarterback Matt Penta (nine carries, 43 yards), who replaced Nick Raneri as the starter following Raneri’s shoulder injury against Duxbury. After a pair of keepers, the freshman dropped back and heaved a ball down field. It avoided a group of Attleboro defenders and fell into the hands of Ryan Gaumond, who raced the rest of the way to the end zone for an 85-yard score that tied the game with just 59 seconds left in the third. Attleboro’s next possession ended with a turnover. Brendan McHugh (nine carries, 38 yards) took advantage of a slip by Michael Strachan and picked off Weir’s pass to get the ball back at the Attleboro 30. Three keepers later and DeMattio slipped through the middle of the Bombardiers defense for a seven-yard score and the lead. The game had turned around for the visitors in just three minutes. The Bombardiers had a chance to tie the game. After a Strachan carry, Attleboro was as close as the North four-yard-line, but Duane Bryant got into the backfield and stuffed Cote for a six-yard loss on third down. On fourth and nine, Cote’s pass to Ethan Cameron was tipped aside by Bryan Engler. North still needed a first down to seal the win. The Rocketeers got that and a lot more, as DeMattio broke through the middle and raced 90 yards for his third touchdown of the game and the cue for the Attleboro crowd to head to its cars. Attleboro was on its heels at the start of the game, as North drove into the wind all the way to the Bombardiers 10. On first and goal, the Rocketeers fumbled the hand-off and Raneri dove on the ball for a loss of two. Penta was stopped by a host of Bombardiers on second down, including Nick Evans, and gained only one. Isaac Guidel pressured Penta into an incomplete pass on third down and then the fourth down pass to McHugh was inches out of the back of the end zone. The Bombardiers flipped the momentum by driving down field and taking the lead. Cote gained 18 yards on a third-down toss to the left and Weir broke free for 44 yards on a pair of keepers to get inside the North five. Cote punched it in from two yards out to make it 7-0. The teams traded turnovers for the remainder of the half. Desmond Woodson recovered a fumble, but Attleboro went three-and-out to give it back. Then Cameron picked off a Penta pass, only for Engler to intercept a Weir pass inside the 10. Weir got the ball back with a fumble recovery just before halftime to keep the Bombardiers in the lead at the break. North Attleboro closes the season at 8-3 and won its 61st game in the series, which had its 98th Thanksgiving Day installment on Thursday. Attleboro closes the season at 4-7. MANSFIELD, Mass. – All the build-up to Friday night’s Kelley-Rex division title showdown at Alumni Field presumed that Mansfield and Attleboro were going to slug it out in a defensive battle with points difficult to come by. It turned out to be the exact opposite. Senior Khristian Conner scored with 32 seconds remaining in the game to give Mansfield the edge over the Bombardiers 42-35 and clinch the Hornets at least a share of the league title. It is Mansfield’s first division championship since 2013. “It means everything,” said Conner about getting back on top in the league. “We worked hard over the summer for it. We just kept with it, didn’t let anything stop us and we just got the win. It feels amazing. It feels awesome. Attleboro took its only lead of the game with 1:39 remaining in the fourth quarter. Justin Cote (seven carries, 50 yards), who had also caught a 20-yard pass on the go-ahead drive, raced up the middle for a 12-yard score that tied the game at 34-34. Two false starts pushed the extra point attempt back 10 yards but sophomore Colby Briggs was unfazed and split the uprights to put the visitors in front. The Bombardiers had forced Mansfield to punt just twice on the night, but after Nick Evans sacked Hornets quarterback Aidan Sacco for no gain the hosts faced fourth and 10 from their own 26. Sacco (5-of-8, 111 yards) bought time and hit Cincere Gill for 28 yards over the middle. The sophomore, who rushed for three touchdowns on the night, was covered but managed to pull in the pass to keep the game alive. Sacco (nine carries, 79 yards) rushed for nine yards and then broke free on a keeper to the left sideline for 26 yards and got out of bounds at the Attleboro 11. On the next play, Conner completed the comeback by finding a seam right up the gut for the score. “They’re a really good team – good defensive team, good on offense – and they have great players but we just had to fight through it to be the better team,” Conner said. Attleboro’s offense had found ways to come back all game long, but with only 32 seconds, there just wasn’t enough time to get up the field and a pass to Cote for four yards on fourth and 10 ended the game. Both offenses were able to move the ball from the opening kick-off. Mansfield took its opening possession 56 yards on seven plays to get a quick lead. Gill finished off the drive with a seven-yard sweep. The Bombardiers returned the favor with a 12-play, 75-yard drive on its first possession. Attleboro surprised the Hornets by going to the air with greater frequency than usual and junior Jason Weir (18-29, 251 yards) had a big night, hitting nine different receivers. After catching a halfback pass from Ethan Cameron (five catches, 69 yards), Weir capped the drive with a three-yard toss to Jacob Weatherford. Mansfield got the lead back late in the second quarter when Sacco threw a 26-yard strike to Conner, who had gotten wide open in the front corner of the end zone. Attleboro answered right back, as Weir connected with sophomore Justin Daniels to make it 14-14 with 2:28 left in the half. That was plenty of time for Mansfield to add another touchdown. Sacco got the Hornets to the Attleboro 31 and then Gill broke free for his second score of the night. He cut back on a sweep, finding a hole in the middle of the line and exploding through it. Even with just a minute on the clock, Attleboro was able to get the ball into the red zone again and had a touchdown called back when the officials ruled Weir had cross the line of scrimmage before he threw. Makhi Baskin picked off the final throw of the half. 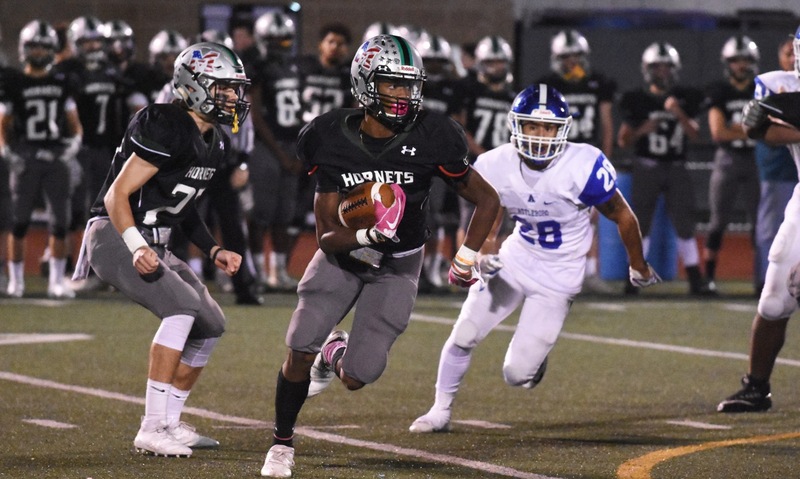 Coming out of the break, the Bombardiers got the ball again, but on the first play Weir was stripped of the ball and Holmes recovered for the Hornets at the Attleboro 23. Mansfield took advantage of the short field and Sacco got on the board with an 11-yard keeper to make it 28-14. It felt like the Hornets were about to break the game wide open. Instead, Attleboro came right back down field and cut the lead to one score. A 13-play, 75 yard drive ended on a one-yard sneak by Weir to make it 28-21. The track meet continued on Mansfield’s next possession. Sacco hit Conner for a 26-yard completion to get into Attleboro territory. Four plays later, on fourth and two from the 21, Gill took another sweep around the end and broke free, adding his third touchdown of the night. Attleboro would give itself a lifeline by blocking Michael DeBolt’s extra point attempt, but it was a 13-point Mansfield lead. Attleboro made it a quick response. Weir got the ball out to the sideline to Kevin Velazquez-Rivera, who then turned up field and showed off his speed for a 45-yard touchdown. Evans made a huge stop on third and five, stuffing Sacco for a four-yard loss and forcing a rare Mansfield punt. The Bombardiers came right back, with Weir connecting with Cameron on a fourth down pass to the near sideline that kept the drive going. After a 20-yard completion to Cote, the senior running back took it himself, going straight up the middle for the 12-yard TD. 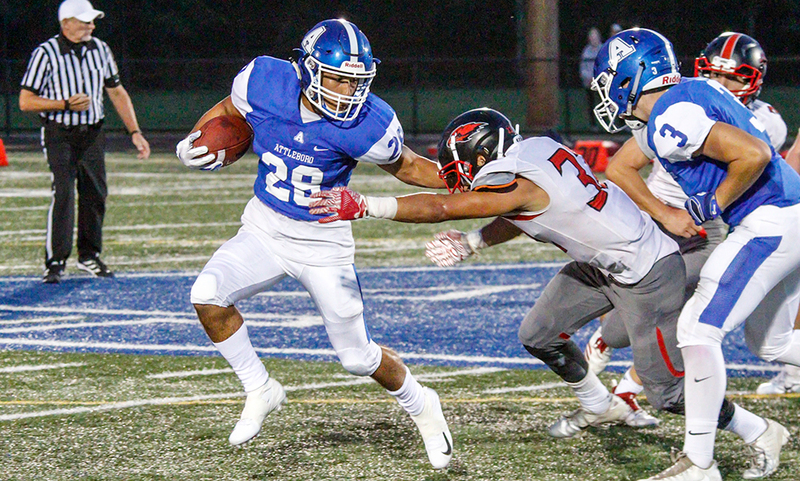 Briggs held his nerve to put Attleboro in front and on the verge of arguably the program’s biggest win since its move to the Hock. But, Mansfield showed that it has some grit as well. The Hornets found a way to pull out the victory and will go into the final week of the regular season with a chance to clinch the title outright. Mansfield (5-1, 4-0) will travel to Oliver Ames next week to try and close out a perfect league campaign and potentially take the top spot in Div. 2 South. Attleboro (4-2, 2-2) will try to bounce back and possibly secure a first round home game in the Div. 1 South tournament with a trip to Franklin. ATTLEBORO, Mass. – The combination of Attleboro quarterback Jason Weir and running back Justin Cote is going to be a handful for opposing teams this season. Milford found that out firsthand on Friday night. Weir and Cote combined for over 200 yards on the ground, helping the Bombardiers open their season with a 21-7 win over the visiting Scarlet Hawks. The Bombardiers had 28 rushing plays in the second half compared to just one passing attempt. Weir accounted for 139 yards of offense, going 6-for-8 for 41 yards and one passing touchdown while picking up 98 yards and one rushing touchdown on 17 carries. Meanwhile, Cote had 125 rushing yards on 15 carries and scored once. Both defenses stood tall to start the game but a mistake of special teams opened the door for Attleboro to cash in. A punt from Attleboro’s Nolan Jaeger was dropped at the 10-yard line and Bombardier Isaac Guidel pounced on the loose ball to get possession back for the hosts. Milford’s defense stood tall for the first three plays, including dropping Cote for a loss on third down but Attleboro decided to go for it. On the first play of the second quarter, Weir hit junior Ethan Cameron as he faded to the corner of the end zone for a 16-yard touchdown. Colby Briggs’ extra point put Attleboro up 7-0 with 10:54 left in the second quarter. Milford’s offense stalled at its own 28-yard line but senior punter Sean Lehane drilled a deep kick that just rolled into the end zone for a touchback, forcing Attleboro to drive 80 yards. Attleboro got halfway there before having to punt. The Bombardier defense came up with a big stop again, forcing Milford to punt from its own 33-yard line. Lehane once again came up big as his punt was downed at the Attleboro 12-yard line. With little time left in the half, Attleboro couldn’t get much further than midfield and a strip sack from Ryan Hazard ended the drive as time expired on the first half. The Bombardiers’ offense set the tone for the second half with its first drive, going 80 yards on 10 plays. Cameron had a 9-yard rush, Weir had a 12-yard run and Cote rattled off a 28-yard rush during the drive. A 9-yard rush from Cote got Attleboro to the 1-yard line and Weir did the rest from there, using a sneak to squeeze up the middle for a score and a 14-0 advantage with 5:42 left in the third quarter. Milford ran its only three plays of the quarter but Attleboro’s defense came up with a stop on third and short and had to punt. Starting at its own 28-yard line, Attleboro used 13 plays — all rushing — to cover 72 yards. Weir converted the first three third downs on the drive before the Bombardiers were faced with fourth from the 33-yard line. Cote burst out to his right, hesitated to fake out a defender, and then took off again, racing through defenders for a 33-yard score and a 21-0 lead with 7:02 in the fourth quarter. Milford put together its best drive of the game in response to Attleboro’s third touchdown. Junior Colby Pires (16-for-23, 101 yards) hit Lehane and Hugo Lopes on back-to-back nine yard completions, earning Milford’s first first-down of the second half. Brendan White (six catches, 60 yards) hauled in an eight yard pass, and one play later, went for 23 yards on fourth down. Four plays later, Luke Rosa broke through two tackles in the backfield and plunged through the defense for a 1-yard touchdown. Lehane hit the extra point and then used a perfect chip that allowed Dylan Ortiz to go up and catch the onside kick. Milford began to move the ball again, picking up back-to-back first downs but Pires was hit as he threw on the next play and Cameron hauled in the pass for an interception. Although Milford’s defense stopped Attleboro on three straight plays, Attleboro’s defense got the ball right back when Jaeger intercepted the Hawks’ first play of the next drive. “[Milford] played us really tough, they did a good job defensively,” Strachan said. “That’s a good football team with a lot of good players, I think they’re going to do well in their division. Attleboro football (1-0) is back in action on Friday when it travels to Dartmouth. Milford (0-1) has its home opener next week when it hosts Franklin. King Philip, 7 @ North Attleboro, 14 – Final – Click here for a Recap and Photo Gallery from this game. 1st Quarter: (NA) Brendan McHugh 16-yard run, Tyler DeMattio XP good; (KP) Ryan Halliday 80-yard run, Cole Baker XP good. 4th Quarter: (NA) B. McHugh 33-yard run, T. DeMattio XP good. Milford, 7 @ Attleboro, 21 – Final – Click here for a recap and photo gallery of this game. 2nd Quarter: (A) Jason Weir 16-yard pass to Ethan Cameron, Colby Briggs XP good. 3rd Quarter: (A) J. Weir 1-yard rush, C. Briggs XP good. 4th Quarter: (A) Justin Cote 33-yard rush, C. Briggs XP good. (M) Lucas Rosa 1-yard rush, Sean Lehane XP good. 2nd Quarter: (DR) 2-yard rush, XP good; (DR) 10-yard rush, XP good. 3rd Quarter: (C) Johnny Hagan 24-yard pass to Jace Emma, XP failed. 4th Quarter: (C) J. Hagan 30-yard rush, 2pt conversion failed; (C) Gersom Rivera 3-yard rush, 2pt conversion failed; (C) Kyle Fitzgerald 5-yard rush, Owen Lehane XP good. (DR) 5-yard rush, XP failed. 1st Quarter: (H) Charlie Egan 8-yard rush, Jonathan Bearden 2pt rush. 2nd Quarter: (H) Jack Johnson 11-yard pass to Kevin Shea, C. Egan 2pt rush; (F) Liam Foley 32-yard pass to Rob Fay, 2pt conversion failed. 4th Quarter: (H) J. Bearden 9-yard rush, 2pt conversion failed. 1st Quarter: (A) Field goal good. 2nd Quarter: (F) Sean Hofferty 1-yard rush, Parker Chevront XP good; (F) Nick Gordon 1-yard rush, P. Chevront XP good; (F) Austin Jordan 44-yard interception return, P. Chevront XP good. 3rd Quarter: (A) 1-yard rush, XP good. 4th Quarter: (F) N. Gordon 66-yard rush, P. Chevront XP good; (F) Jack Nally 4-yard rush, P. Chevront XP good. Mansfield, 21 @ BC High, 7 – Final – Click here for a recap of this game. 1st Quarter: (M) Damani Scott 18-yard pass to Nick Marciano, Nico Holmes XP good. 4th Quarter: (BCH) Jacob Perez 12-yard rush, XP good; (M) Cincere Gill 18-yard rush, N. Holmes XP good; (M) C. Gill 4-yard rush, N. Holmes XP good. 1st Quarter: (OA) Cam Perron 20-yard pass to Nathan Cabral, C. Perron XP good; (OA) N. Cabral 12-yard rush, XP failed. 2nd Quarter: (CC) Christian Gemeli 17-yard rush, XP failed; (CC) C. Gemeli 27-yard pass to Cam Ladd, XP good. 4th Quarter: (CC) C. Ladd 20-yard rush, XP failed; (OA) C. Perron pass to Shane Kilkelly, 2pt conversion failed. 3rd Quarter: (S) Aaron Strong 25-yard rush, Mitchell Director XP good. 4th Quarter: (N) 50-yard pass, XP failed. 1st Quarter: (S) Jeff Grier 86-yard rush, XP failed. 2nd Quarter: (S) Chris Ais 10-yard rush, Malachi Green-Hightower 2pt rush; (F) Jack Beverly 41-yard pass to RJ Viele, J. Beverly 2pt pass to Dante Marino. 3rd Quarter: (S) J. Grier 5-yard rush, M. Green-Higtower 2pt rush; (S) Anthony Burke 20-yard pass to J. Grier, Josh Cocchi XP good. 4th Quarter: (F) J. Beverly 29-yard to Gabe Paixao, J. Beverly 2pt pass to R. Viele; (S) M. Green-Higtower 1-yard rush, J. Cocchi XP good; (S) J. Cocchi 25-yard interception return, J. Cocchi XP good. (F) Reece LaChance 5-yard rush, 2pt failed. 2nd Quarter: (NB) Latrell Canto 10-yard rush, XP failed. 4th Quarter: (T) Noah Leonard 65-yard pass to Brayden Merrill, Coby Adams XP good. Milford, 2 @ Franklin, 1 – Final – Milford junior Walisson de Oliveira scored a pair of goals, including the game-winner with under 10 minutes to go, to lift the Hawks to a win on the road. de Oliveira opened the scoring off an assist from Anthony Salvador but Franklin freshman Terry O’Neill tied the game just before halftime. de Oliveira scored the unassisted game-winner with seven minutes to play. Sharon, 0 @ King Philip, 2 – Final – King Philip sophomore Camron Lawrence bagged a brace to lead the Warriors to their first win of the season. After Zac White drew a foul at the top of the box, Lawrence placed his shot back post to put KP up 1-0. With Sharon pushing numbers late to tie it, KP intercepted a pass and Lawrence was able to place a shot into the empty net to seal the deal in the 78th minute. Mansfield, 4 vs. Dartmouth, 1 – Final – Mansfield senior Luke Savoie scored a hat trick for the second straight game as the Hornets dispatched of visiting Dartmouth. Junior Owen Mullahy opened the scoring for the Hornets just two minutes into the game, finishing off a free kick from Derek Meuth. The Hornets doubled their lead when Savoie scored off a long throw from Cam Eddy. Dartmouth cut the deficit to one at half but Mansfield added two more in the second half. Savoie headed in a feed from Ethan Brill-Cass and completed the hat trick with seven minutes to go, scoring off Tommy Lanzillo’s free kick. Anthony Salisbury made 11 saves in net for Mansfield. North Attleboro, 1 @ Taunton, 1 – Final – North Attleboro jumped ahead just before the midway point of the first half but Taunton found the equalizer in the 66th minute to earn a point. Gerson Bonilla cleaned up a rebound in the 18th minute to put the Rocketeers up. Joe Hilf’s header was denied on a terrific save by Taunton goalie Nolan Melo but Bonilla buried his chance. In the 66th minute, Taunton’s Colby Fernandes took advantage of a turnover and used a volley to bring the Tigers level. Kyle Briere made three saves for North Attleboro. Stoughton, 0 @ Oliver Ames, 3 – Final – Click here for a recap and photo Gallery of this game. Franklin, 4 @ Milford, 0 – Final – Erin Quaile, Calen Frongillo, Carly Alston, and Sydney St. Marie each scored in the first half to put Franklin in control of its season opener. Grace Gallo and Halle Atkinson each had assists in the win. King Philip, 6 @ Sharon, 0 – Final – Chloe Layne opened her account for the season and finished with a hat trick, while Avery Snead scored two and assisted on two others, as KP got its first win of the season. Makayla Griffin added a goal and two assists and Lauren Anderson had a pair of assists in the win. Sophia McLaughlin earned the clean sheet in net. KP finished with 17 shots in the game. Sharon, 0 @ King Philip, 12 – Final – King Philip opened its season with a big win at home over visiting Sharon. Senior Alli Meehan had four goals and three assists, freshman Meghan MacDonald netted a hat trick and added two assists and Olivia Kulesza scored three goals for the Warriors. Sharon, 0 @ King Philip, 3 – Final – King Philip began its 2018 season with a 3-0 sweep of Sharon (25-17, 25-12, 25-14). Catherine Waldeck had 10 kills for the Warriors while Nicole Coughlan added four kills and three aces. Kat Kmetz finished with three kills, three aces, and 18 service points and Grace Ely added three aces, three kills, and six service points. Oliver Ames, 3 vs. Bridgewater-Raynham, 0 – Final – Oliver Ames bounced back from its season-opening loss to earn a win over visiting Bridgewater-Raynham (25-17, 25-15, 25-16). Senior defensive specialist Grace McCallum had a strong game for the Tigers with six digs, five aces and two kills. Senior Sadie Homer added 18 digs, junior Allie Kemp finished with 21 assists and three aces, and junior Jordan Bosse put down 11 kills with two aces. North Attleboro, 172 @ Foxboro, 177 – Final – North Attleboro’s Jillian Barend earned medalist honors for the Rocketeers, carding a team-low round of 40. Taunton, 92 @ New Bedford, 77 – Final (Stableford) – Taunton’s Kyle Robinson had a team-best round of 43 to pace the Tigers to a win at the Whaling City Golf Club. Spencer Andrews and Sean Bunker each shot 45 to help Taunton.